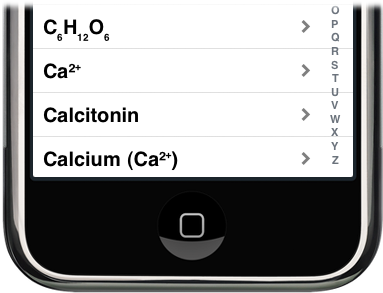 I have written a handful of iPhone apps now and used UITableView extensively in one of them. Until recently, I had never needed to put any rich text into a UITableViewCell. I had a nagging feeling about approaching the problem this way and after the writing the code and seeing the woeful performance of UIWebView I remembered what it was. Months ago I listened to this mobile orchard interview with the Joe Hewitt, creator of the Facebook iPhone app and the open source Three20 Project. Seeing the slugglish rendering of my beautifully marked up index terms, I recalled that the unsuitability of UITableView for web content, was one of the motivations for the Three20 project (or it's original implementation in the Facebook app). I decided against using Three20 partially because of an unreasonable case of not invented here syndrome, but also because I didn't have the time to invest in learning a new framework. I also felt like my problem was a pretty simple subset of the rich text rendering problem (just the sub-scripts and super-scripts), so there must be a simple solution. It occurred to me that UITableView does a great job of rendering unicode characters (both Ballet Index and Karate Index render unicode characters in the table and they look great). So maybe there are sup-scripted and super-scripted unicode characters for the small set of characters that I needed (+,- and the numbers)?